Osteoarthritis is a common condition in both humans and dogs alike. As we age, we experience osteoarthritis in weight bearing joints such as knees, hips and elbows. The spine can also experience some arthritic change leading to discomfort and decreased mobility. Osteoarthritis, also known as degenerative joint disease, is a progressive deterioration of the cartilage that surrounds, cushions and protects the joints. Common signs of arthritis include: decreased level of activity, difficulty getting up, and stiffness while walking. These symptoms of arthritis are worse in the early mornings, after lying down for a prolonged period of time, and during bouts of cold weather. Osteoarthritis can be seen in a dog of any age, but is most commonly seen in older dogs, those who have a pre-existing condition such as hip dysplasia, or injuries such as fractures or ligament tears. Another primary cause of arthritis in dogs is obesity. With additional body weight, there is an increased stress on the joints, which leads to deterioration of the cartilage. There is no cure for osteoarthritis in dogs, and the goal of treatment is to slow the process down and alleviate the patient’s pain. Fortunately, there are several beneficial treatments to help your dog maintain an active, healthy and comfortable lifestyle, even with osteoarthritis. Traditionally, treatment for arthritis has been focused on medication to relieve joint pain and inflammation. Some veterinarians also incorporate joint supplements, weight control, specially formulated diets and/or holistic herbs to give arthritic dogs more help; but medications alone cannot improve a dog’s strength or fitness level which directly affects mobility. Some consider rehabilitation a tool that is reserved for dogs recovering from orthopedic surgery or injury, but the principles of rehabilitation medicine are fairly universal. The overall goal is to improve comfort, joint motion, strength and endurance so you and your pet can enjoy more active years together. 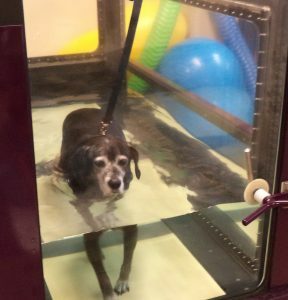 Physical rehabilitation is a specialty with both veterinary professionals and human physical therapists working toward the overall improved care of pets. Some of the different modalities for treatment include therapeutic ultrasound, cold or low-level laser therapy, electrical stimulation, therapeutic exercises, massage, and the underwater treadmill. Not every rehabilitation facility or veterinary hospital is going to offer all of the different modalities and equipment on the market. The most important piece of equipment is a pair of experienced hands.